The OnePlus 6 might be the most boring phone the company has ever made. Don’t get me wrong, that’s not meant as an insult, but more as a reflection on how far the company has come since the original OnePlus One. Because even though OnePlus’ latest device might not carry with it the same excitement as some of the company’s previous phones, as a total package, the OP6 is arguably even more important in today’s world of $1,000 handsets. Oh and it’s also OnePlus’ best phone yet. Back in 2014, the company’s first phone was targeted at spec-obsessed phone nerds who wanted a more affordable device that still had top-of-the-line components, but without the superfluous features or software bloat that you got on the Samsung, LG, and HTC devices of the era. Despite a few technical issues such as yellow-tinted screens and people’s annoyance with the invite system, the OnePlus One was a wild success. It was a hard-edged phone whose backside was literally covered in sandpaper, while also delivering high-end components and the freedom for phone nerds to tinker around with the handset’s inner workings. However, as the company matured, so too have its devices. That once signature sandstone back eventually gave way to metal on the OnePlus 3, before getting replaced by glass on the new OnePlus 6, which mirrors a lot of other phones out right now. Then, at the top of the OP6’s big 6.3-inch display, there’s a notch, another feature that’s very on trend. At this point, notches aren’t cutting edge anymore, they are just a relatively simple tactic for delivering what everyone seems to want: more screen. Even when you enable the setting to hide the notch, you can still kind of see it, which isn’t actually a big deal. Now, not everyone is onboard with these moves, especially among some of the more die-hard fanatics who aren’t really big fans of change. But that’s to be expected as OnePlus seeks a bigger piece of the mainstream pie. OnePlus has hired supermodels to explain its fast charging battery tech, partnered with Disney and fashion brands like Collette for special limited edition phones, and hosted pop up stores around the globe just to get its phones in the hands of a bigger audience. But all those stunts are just distractions, because the OnePlus 6 is a damn good phone. It’s FHD+ OLED screen is impressively vibrant, with brightness hitting 638 nits. That’s better than the Galaxy S9+ (605 nits) and the Huawei P20 Pro (565 nits). It’s performance is as good as any other flagship Android phone, with the OP6 sporting a Qualcomm Snapdragon 845 chip, 6GB of RAM and 64GB of storage standard. And all of this comes from a phone that starts at just $530. That’s $200 less than a Galaxy S9, $270 less than a Pixel 2 XL, and $420 less than a Galaxy Note 8. So yes, even though the OnePlus 6 is significantly more expensive than the OG OnePlus One, which cost $300 when it debuted, it still represents a considerable bargain compared to today’s premium phones. Also, thanks in large part to the improved energy efficiency of that Snapdragon 845 chip, the OnePlus 6’s battery life improved to 13 hours and 3 minutes, despite having the same 3,300 mAh battery as the OnePlus 5T (it got only 11 hours and 22 minutes). So even though the spring phone release season is still ongoing, that 13 hour battery mark is the longest we’ve seen, both this year and all-time. OnePlus smartly isn’t ready to ditch the headphone jack yet. On the inside, OnePlus’ Oxygen OS is the closest thing to stock Android you can get without having a Pixel or a new Nokia phone. Oxygen OS feels fast, its transitions are silky without a hint of jitter, and it even improves on some things Google has in store for the next version of Android. Not only does Oxygen have a built-in dark mode, which supports delicious black backgrounds that take full advantage of the OP6’s AMOLED screen, its optional gesture controls are even slicker. With the gesture controls turned on, there’s no nav bar at the bottom of the screen. Nice. Unlike the half-hearted “pill” in Android P that still takes up room at the bottom of the screen, OnePlus’ gestures completely eliminate any sort of on screen nav buttons. Navigation is as simple as swiping up from the bottom center edge to go home, swiping up and holding to view recent apps, and swiping up on the left or right sides to go back. It’s simple, it’s elegant, and after using it even for a short time, it’s hard going back to an old-school nav bar. The alert slider on the right is a handy way to switch between ringer modes. At the same time, those savings mean the OnePlus 6 doesn’t have every bell and whistle. Like the OP5T, the OP6 sports face unlock that’s quite speedy, but not as secure as Samsung’s iris recognition in the Galaxy S9 or the facial scanning tech in Apple’s FaceID. 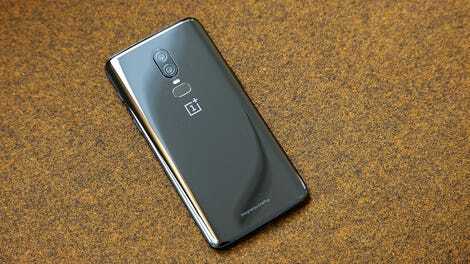 The OnePlus 6 also doesn’t have stereo speakers or wireless charging, the latter of which I find especially annoying because there’s no metal on the back of the OP6 to screw with inductive charging. In bright light, there are a few differences in exposure between the two, but the S9 isn’t that much better. Both phones do a pretty decent job of faking bokeh, but they still have a small halo effect that gives it away. The S9's photo is brighter and features more saturated colors, and the leaves on the trees are sharper too, but once again, it’s quite close. The OnePlus 6 does a good job of not blowing out highlights, but its photo is a little grainier if you look real close. OnePlus also says the OP6 should be able to withstand a quick splash of water, except the phone doesn’t have an official IP rating, so if the phone does comes in contact with water, there are no guarantees it’ll survive. This is one thing I think OnePlus really need to address. OnePlus isn’t really a startup anymore. With revenue of $1.4 billion in 2017, it’s past time the company got its stuff certified so it can truly stand behind its products. And as you often find with a lot of foreign phones, the OnePlus doesn’t support CDMA networks, which means this phone isn’t really an option for people on Verizon or Sprint. As for the OP6’s cameras, OnePlus has reduced the secondary 20-MP cam’s role to only helping out with depth of field effects like in the phone’s portrait mode. It’s a bit sad, because on the OP5, the second cam gave you a little extra zoom, while on the OP5T, it was dedicated to shooting more challenging low-light pics. But what the OP6 lacks in versatility, it makes up for in overall image quality. In fact after a number of side-by-side comparison testing various conditions including bright light, low light and the phone’s portrait mode, I was thoroughly impressed by the OP6’s ability to keep up with the Galaxy S9+. Even though sometimes the 6’s pics weren’t always as sharp or as brightly lit, the differences were often so minimal, it’s really hard to complain. But in the end, that’s kind of OnePlus’ entire purpose. 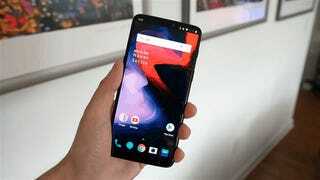 The OnePlus 6 isn’t as feature rich as the Pixel 2 XL, the Galaxy S9+, or even the LG G7, which are its closest competitors in terms of specs. But starting at $530, it also costs just two-thirds the price, and the things that it can do, it does really well. The performance, battery life and camera aren’t just good, they’re great, and there really isn’t another phone priced between $400 and $700 that I’d rather buy. So while that grouping might sound like an arbitrary division, that’s precisely the range people are looking at after balking at the increased prices of so many recent flagship phones. 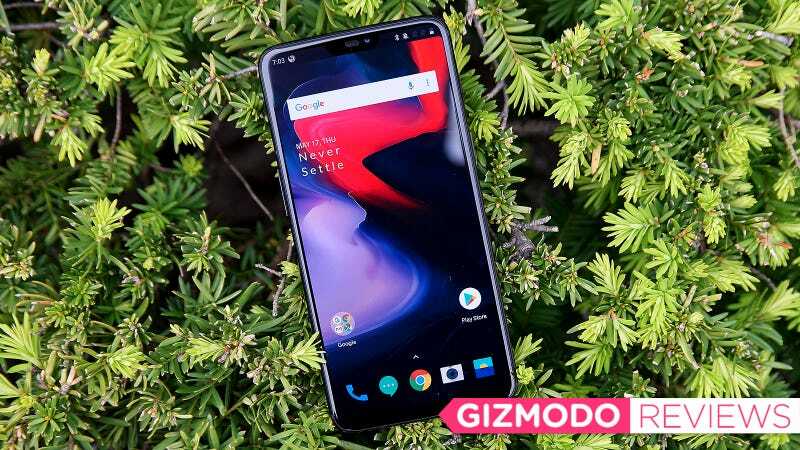 The OnePlus 6 may not be the wildest or most ambitious phone OnePlus has ever made, but it does strike a fantastic balance between what you need, and what you have to shell out to get it. The OnePlus 6 is the company’s first phone with a glass back since the short-lived OnePlus X. Battery life is fantastic, as the OnePlus 6 beat out the Pixel 2 XL, the Galaxy S9+, and the Huawei P20 Pro on our battery rundown test. Missing features include no microSD slot (there is room for dual SIMs though), no wireless charging, and no stereo speakers (there’s just a mono speaker down bottom). As with the OnePlus 5T, OnePlus says the OP6 should be able to survive a bit of rain or a small spill, but without an official IP certification there’s no recourse if something does go wrong. Won’t work on Sprint, Verizon, or other CDMA carriers due to radio band compatibility.